Hubble Space Telescope huggers are celebrating the iconic observatory's 20th birthday, even as scientists anticipate the next generation of bigger and more powerful successors to the famed orbital instrument. 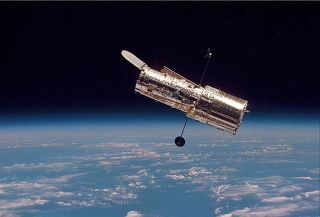 The Hubble Space Telescope launched on April 24, 1990 with a flawed mirror, but survived for two decades in large part because of five repair missions by space shuttle astronauts. Its cosmic gaze has led to breakthrough discoveries about the universe and embedded stunning views of the cosmos in the hearts and minds of the public. "Hubble has done all those things and become an icon of science because it can produce glorious images," said Rick Fienberg, an astronomer and press officer of the American Astronomical Society. But there's bigger and better science yet to come. NASA's James Webb Space Telescope is scheduled to come online in a few years. And a slew of new space observatories are also being considered, even if none have received the official go-ahead yet.